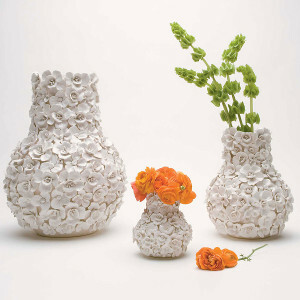 Exquisitely formed, our Bliss Bud Vases are perfect for creating a colorful tableau on a dining table, bookcase or even a deep casement window. Each graceful vase holds a single bloom, a cluster of dried flowers or a few stems snipped from your garden, beautifully displayed and enhanced by the sparkling clarity of the glass and the delicacy of its curved shape. Bliss is sold as a set of four vases with varied dimensions: Dia 4" x H 10 3/4" ; Dia 3" x H 7" ; Dia 3 1/4" x H 6" ; Dia 3 3/4" x H 5 1/2".